This weekend I attended, with my family, the Mass Assembly organised by the Stop the War Coalition in Trafalgar Square which marked 10 years of the war against terror. Like, I imagine, most of the people there, we have been attending these marches since, and before, the illegal war on Iraq. In fact the march was led by 106 year old Hetty Bower who has been campaigning for peace & human rights for most of her life. I was surprised however at the poor turn out as I had expected the place to be heaving especially considering the number of prominent speakers in attendance. So why are numbers dropping? Is it because of the governments exit plan? Doubtful. Or maybe there are so many things to protest about these days that support is spread thin? 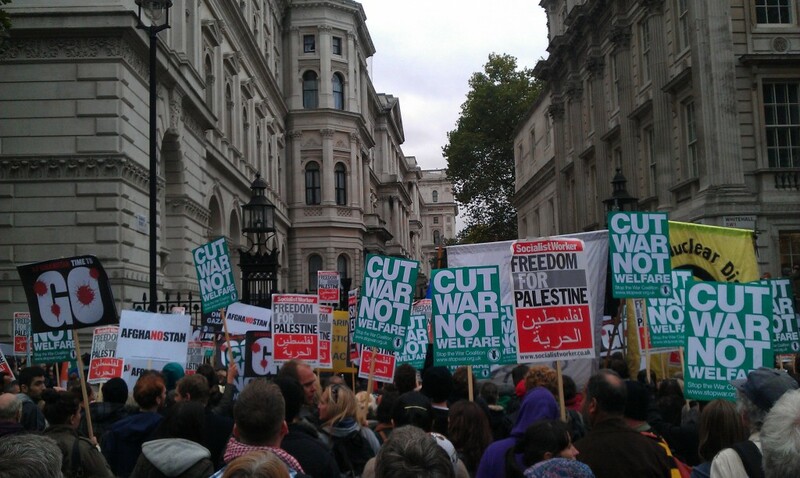 Even the NHS reform protesters only managed to pull a couple of thousand the following day. Are people so concerned about there personal situations under the current regime that war becomes insignificant to them? Do they see demonstrating against war as a betrayal to our troops? It’s not. Poor promotion? Was the campaign relying too much on social networks to spread the word? Or is it the poor news coverage that anti-war protests consistently get? Surely there is no greater cause than that which calls for an end to the murder of thousands of innocents. I don’t know what the answer is but what I do know is that the 12 million (£12,000,000) spent each day on a war that cannot be won could rectify many, if not all, of the issues facing us today.